Choosing the Insurance that Helps Give You Peace of Mind! While you can't predict an accident, you can plan how you'll be able to financially handle one should it occur. 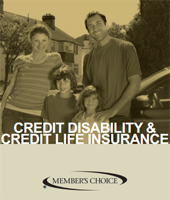 MEMBER'S CHOICE® Credit Life and Credit Disability Insurance plans offer loan-specific coverage. MEMBER'S CHOICE® Credit Life Insurance is a voluntary coverage that can help reduce or pay off your loan balance, up to the maximum limit, if you or your covered co-borrower pass away. MEMBER'S CHOICE® Credit Disability Insurance is a voluntary coverage plan that helps make monthly loan payments, up to the maximum limit, should you become totally disabled, until you are no longer disabled. Build a better understanding by visiting Summit Ridge Credit Union or calling 816-272-6160 to cover your loans today. Estimate your loan payment with Member Choice Credit Life & Credit Disability Insurance!